There's been a lot of talk around here about the recent goings in Sugar Grove, NH. Some of it is even true. Here's how it really all started. Suddenly, the happy rippling sound of a contented crowd vanished. A general sucking in of breath made it sound like the room had fallen into a hurricane. Roland Chick was on his bunioned burdened feet before Alanza could sit back down. His face was changing color like his mother had been an octopus. First green then gray, then almost purple. Even the babies stopped crying. Alanza Speedwell crossed the room, her wispy eggplant colored hair streaming behind her as she moved. Clacking from her thigh high boots was the only sound echoing through the hall as she mounted the stage and found her place card at the contest table. She tugged at her zebra striped mini skirt, which had migrated so far north it was threatening to become a cummerbund. “Well, don’t all stop eating on account of me,” she said, dragging her chair back and settling herself, crossing one plump thigh over the other. Most women in New Hampshire don’t wear skirts on a daily basis. They certainly don’t once the temperature at night drops below freezing. Just looking at hers dropped the temperature in the room by several degrees. Alanza was like a portable air conditioning unit. I only wished it were July instead of November. “I think your arrival has caused most people to lose their appetites,” Roland said from the other end of the table. At least someone had enough sense not to seat them together. “Nobody puts me off my feed, especially not with my favorite cheerleader here to egg me on,” Grampa said blowing a kiss at Grandma. The official referee blew his whistle and the competition began. Cheering erupted from the hall and children stood in their folding chairs to get a better view of adults eating in a way they’d be sent from the table for imitating. Roland held his own for the first three towering stacks of pancakes despite his heart troubles and his wife’s admonishments to consider his health. The teenagers came on strong at the beginning but faded fast once the fourth and fifth stacks were placed in front of them. Only Alanza and Grandpa remained by the sixth stack of steaming cakes. Grampa shifted in his seat in just the way he did every year at Thanksgiving to make room for pie. Alanza seemed to favor saturating the pancakes with so much syrup they dissolved into a pile of mush and needed no chewing. Only slowing to swat his beard out of his plate, Grandpa maintained a steady pace through his seventh stack. Alanza, however, began to slow down. Her shoulders slumped and her eyes became glazed. Squinting at her carefully, I noticed a bit of foam forming at the corners of her mouth. Before I could ask if she was all right she swayed gently, let out a deep moan and pitched face first into her plate. Jessie loves to connect with readers on FaceBook and Twitter. Or visit her website. 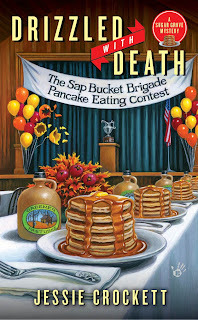 Well, this isn't going to put me off pancakes. But five or six stacks? Oof! Lovely excerpt! 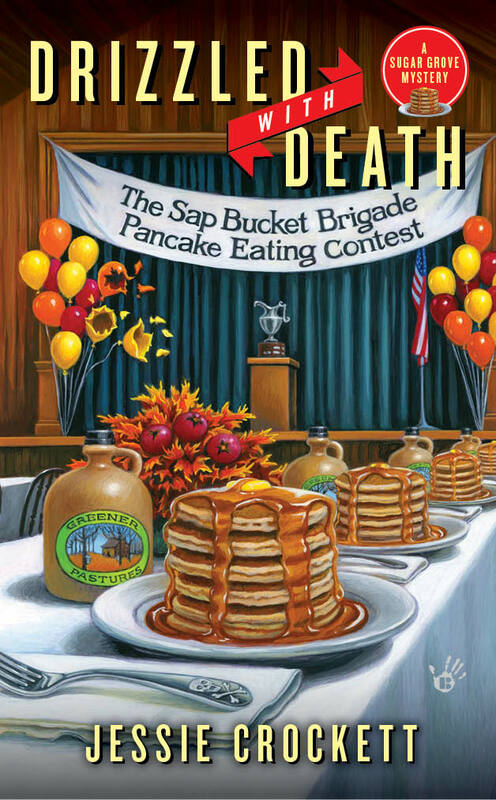 As a fellow New Hampshire-ite, I can't wait to read Jessie's Drizzled With Death. This scene alone has me hooked! Wow, how many pancakes are there in a stack? I am really looking forward to reading this book.